“Her yer Taksim her yer direniş!” (Everywhere is Taksim, everywhere is resistance). 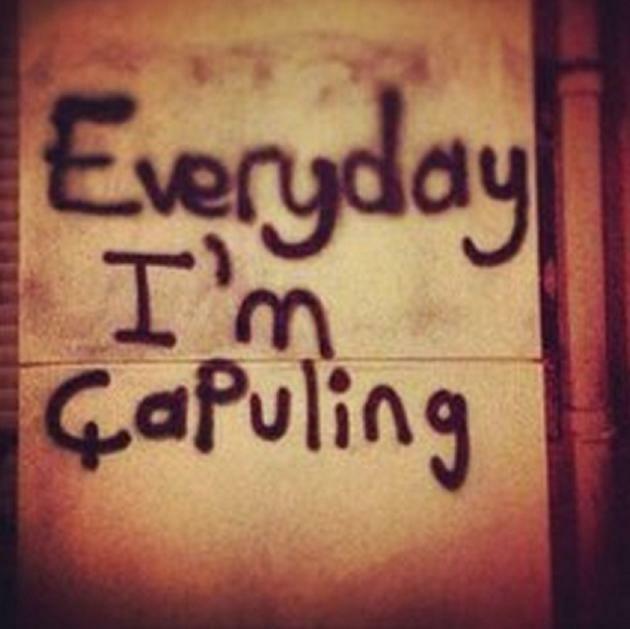 Chanted by protesters from Istanbul, across Turkey and around the world, this slogan encapsulates the Turkey protests, which are entering their second week. On the surface its meaning is clear enough: the protesters self-consciously connect their particular struggle to grassroots democratic movements around the world, including the Arab Spring uprisings and Occupy movements of 2011-2012. What began at the end of May as a peaceful sit-in by a small group of citizens in Gezi Park against the destruction of one of Istanbul’s last green spaces to build a shopping mall and military barracks has turned into a mass protest against Turkish prime minister Recep Tayyip Erdogan’s heavily pro-development policies and what many are calling his heavy-handed, authoritarian style of leadership. Reelected to a third term by a 50% majority in 2011, Erdogan and his party, the AKP, have presided over a decade of unprecedented economic growth in Turkey, but have drawn criticism from many Turks for a “top-down” approach to governance, for his party’s pro-Islamist bent, and for the gradual erosion of freedom of the press, freedom of speech, minorities’ and women’s rights during his time in office. 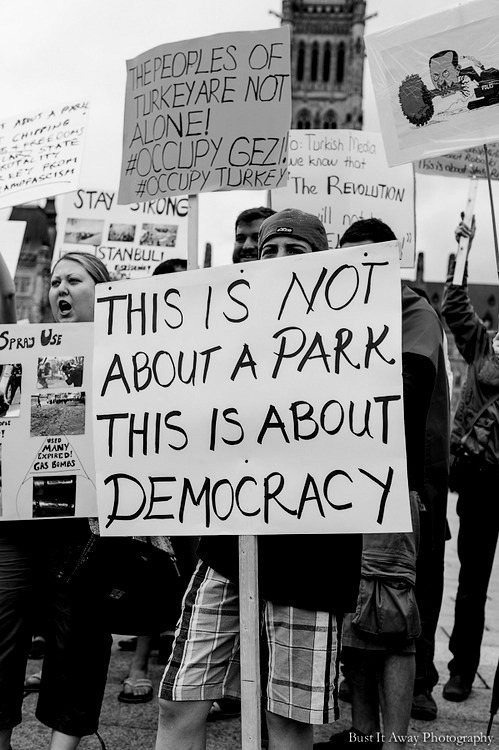 The protests are about much more than a park; they are about democracy and the future of Turkey. On May 28, a group of environmentally-minded citizens who had gathered in Gezi Park to oppose the construction were met with riot police, sprayed with tear gas and water cannons. 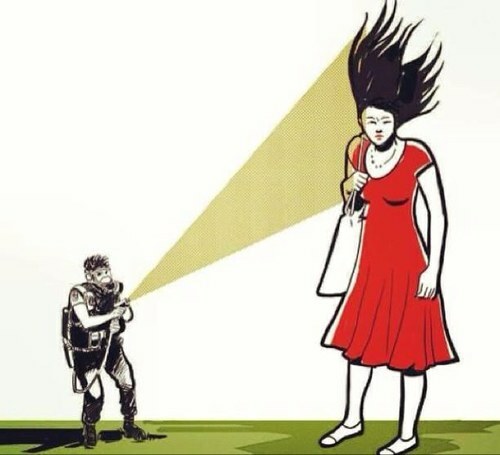 One of them was the “woman in the red dress,” who has become an iconic symbol of the protests (albeit a reluctant one, saying she is “no different” from any of the other protesters who were gassed). Her name is Ceyda Sungur, and she happens to be a professor of urban planning in the architecture faculty at Istanbul Technical University, just a two minute walk from the park. Sungur and her colleagues had signed a recent petition criticizing the government’s “top down” approach to construction projects across the city, which read in part, “All these top-down decisions disregarding planning and urban management principles are not approved by Istanbul’s citizens. 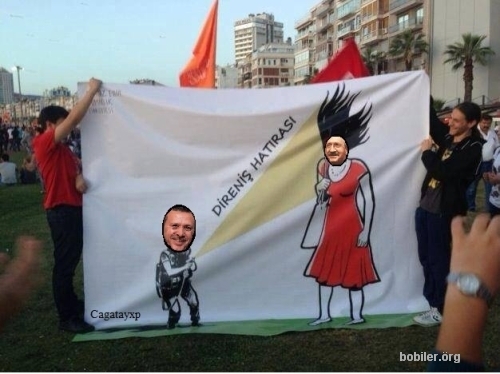 We don’t accept them.” Along with some of her colleagues, Sungur had gone to the park in the afternoon to join the protests. 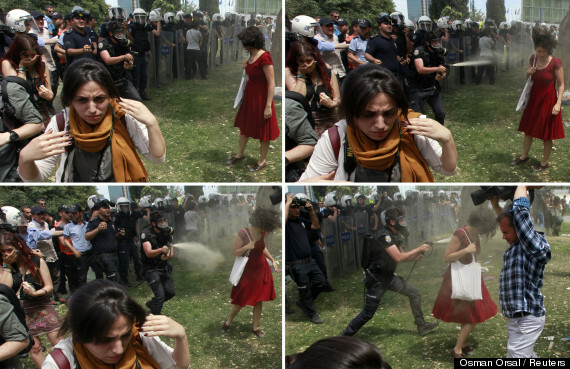 A Reuters photographer snapped photos of her walking across the grass in a red summer dress and carrying a white bag, while her hair is blown upwards by the violent force of a tear gas canister sprayed in her face several times by a gas-mask-wearing police officer charging toward her, an unprovoked assault on an unarmed, non-threatening citizen. The images spread rapidly worldwide via social media. The protests spread as well, engulfing Taksim Square where riot police engaged thousands of protesters on June 1 and 2. To date, there are three confirmed deaths and over 4000 injured across Turkey, and more than 1900 have been arrested. Although deputy prime minister Bulent Arinc apologized last Tuesday for using excessive force against the protesters in Gezi Park, calling it “unfair” and “wrong,” Erdogan has refused to back down, vowing to move ahead with the construction and blaming the protests and violence that followed on “extremists” and social media. “There is now a menace which is called Twitter,” Erdogan is quoted as saying. “The best examples of lies can be found there. To me, social media is the worst menace to society.” But as this Guardian article noted, “The dramatic events also exposed the complicity and almost complete government control of mainstream Turkish media, which has largely failed to report the protests.” Indeed, the broadcast media in Turkey participated in an almost total blackout of the protests, running cooking shows and documentaries about Hitler and penguins instead. “The Turkish media have embarrassed themselves,” said Koray Caliskan, a political scientist at Bosphorus University, quoted in the Guardian. “While the whole world was broadcasting from Taksim Square, Turkish television stations were showing cooking shows. It is now very clear that we do not have press freedom in Turkey.” This photo, taken by Bloomberg’s Turkey bureau chief and posted on the Occupy Gezi Tumblr page, shows a side by side comparison: CNN-Turk was broadcasting the penguin documentary on June 2, while CNN-International and every other major international news outlet were covering what was happening in Taksim Square. Like the “woman in a red dress” photo that has become a symbol of citizens struggling against police brutality and an authoritarian government, this photo is also iconic, symbolizing mainstream media censorship in Turkey. 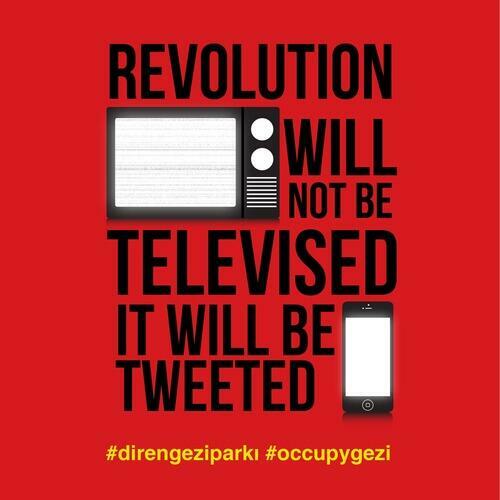 The phrase “The Revolution will not be televised, it will be tweeted” is taking on a new meaning in this context. If national broadcast media will not cover what is happening as ordinary citizens take to the streets in protest of their government, then social media and citizens’ journalism will. Several social media/citizen journalist sites have developed to fill the void and provide on-the-ground perspectives, including Reddit, the online image hosting service Imgur, personal blogs, the Occupy Gezi Tumblr page, the Occupy Gezi Facebook page, this Facebook page run by Taksim Press/Taksim Basini, and of course Twitter. On June 5, #wearegezi was the number one trending Twitter topic in the U.S. An NYU study found that over the course of the first weekend of the protests (May 31-June 3), Twitter users sent over 10 million tweets with hashtags related to the protests (#occupygezi, #direngezipark, #geziparki), at rates of up to 3000 tweets per minute. Approximately 90 percent of all geolocated tweets during that time period came from within Turkey, and half of those from within Istanbul. About 80 percent of the tweets were in Turkish. For comparison, only 30 percent of tweets during the Egyptian revolution were geotagged from within Egypt; suggesting that the primary audience for the Turkish protests is a local one rather than a global one. It seems clear that social media is becoming a primary source of information for participants in the protests and for those who are following them, due to widespread distrust of mainstream media. Protesters are using Google Maps to crowdsource information about police movements in Istanbul (see realtime map here), and Reddit to share information on how to defend against tear gas. Alarmingly, 34 people were arrested last week by Turkish police in Izmir for using Twitter, accused of “spreading untrue information” and inciting anti-government sentiment. All are between the ages of 20 and 25. Hurriyet News reported on June 6 that 33 of the 34 detainees had been released. What is happening in Turkey raises a number of questions about the role of social media in social protest movements. How is protest different in an age of Twitter, Reddit and Facebook? Obviously information can spread much more rapidly in a much shorter time, even circumventing mainstream media censorship. Thanks to social media, this movement has grown very rapidly despite a national broadcast blackout: hundreds of thousands of Turkish citizens have joined the protests in cities across the country, and solidarity protests have also been held (among other places) in Cyprus, Tunisia, Egypt, Rotterdam, Geneva, Amsterdam and Berlin, Paris, London, Ottawa, and New York’s Zuccotti Park. Three Turkish-American tech professionals living in New York used Indiegogo to crowdfund a full page New York Times ad entitled, “What is happening in Turkey?,” which ran in the Times on Friday, June 7. This was one of the fastest raises in Indigegogo history, reaching the $53,000 goal in just 18 hours. The entire process was crowdsourced from start to finish, from an initial Twitter call asking what could be done to show solidarity with the protests, to the decision to place an ad in a major U.S. paper, to which fundraising site to use, the fundraising process itself, which newspaper to advertise in, what the ad should look like (users cast their votes on different mockups), drafting the text of the ad, to a Reddit page on what should be done with the money left over after paying for the ad. In Izmir, you can even put your head inside a life-size version of the image and be photographed for your very own direnis hatirasi, “resistance souvenir.” It’s a different kind of souvenir, though; it’s a social media souvenir, a reminder, whose purpose is not to evoke individual memories of a nostalgic past trip but rather to remind the Turkish government of the power of its citizens and of their commitment to democracy. In doing so it echoes the chapullers’ goal of “reminding governments of their reason for existence in a peaceful and humorous manner,” so as to “take the democracy of a nation to the next step.” And this next step is, indeed, what the protesters want: in a list of demands to Erdogan and in a meeting held last week between deputy prime minister Arinc and the protesters, they call for an end to police violence, the immediate release of all protest detainees, and the promise that Gezi Park will be left alone. Not revolution but immediate and lasting reform seems to be the message. “It is kind of a Woodstock. It is not Tahrir,” said Betul Tanbay, a math professor and one of the founders of the Taksim Solidarity Platform, one of the groups that met with Arinc. Reports from many of the protest sites around Turkey do suggest similarities with the “Occupy” movements, with a festive, loosely-structured, coalition-based feel to the protests, although there are also reports of continuing police violence in areas where there is not as much of an international media presence. What the lasting impact of the events of the past 10 days will be remains to be seen, but the protests have already had important effects. They have demonstrated the power of the Turkish people’s commitment to participatory democracy to a worldwide audience. The protesters have creatively used the resources of social media to convey the most important messages of this struggle. And in doing so, the actions and words of the protesters, defiantly vocal in the face of mainstream media silence, have had an impact on the broadcast media that was originally complicit in their (self)?-censorship. Turkish journalists who had previously chafed under these restrictions are now openly declaring their support. A Hurriyet Daily columnist wrote on June 6 that thanks to the protesters’ courage, “news channels started showing the courage to do justice to the news and to do their job. . . . I am confessing: We have done nothing, but nothing. We were not able to do anything. You have done everything, but everything.” Another columnist writes, “They may be disorganized but this is the most political people’s movement in the Turkish history,” calling it an “accelerated democracy workshop.” As they wait for an official response from Erdogan, the protesters keep on chapulling.